Easter is nearly here, bringing with it signs of spring. One of my favorite things on these special days is to gather my family and friends to share good food and stories and, of course, add to the place in my mind that stores so many precious memories. I find as time passes, these memories and unforgettable moments become even more priceless once a loved one is no longer seated at the table. Remember, every minute is a gift. I ask each of you to also remember there is someone, somewhere in our community, who may need a little help making this Easter one to remember. Please consider giving to Friends in Service Helping, Ron Wood Family Resource Center, Food for Thought or some other community outreach service. Without looking too hard, you may find someone right down the street who could use a little help delivered with love. Happy Easter from my family to each of you. Make some beautiful memories. Place chorizo in a saucepan and cook over medium heat. Rough-chop the chorizo when it’s about half done. This will make chopping easier. When done, remove from pan and drain on paper towel and set aside. While the chorizo is browning, combine eggs and heavy cream in a bowl, and thoroughly whip. Add pepper, cumin and salt. Rough-chop the cilantro and set aside. Finely chop the de-seeded jalapeno pepper and green onions. Add cilantro, jalapeno and green onions to the egg mixture and gently fold ingredients together. Once that’s complete, gently fold in drained chorizo. Pour the mixture into a buttered, 12-inch, deep-dish pie plate. Bake at 350 degrees for eight minutes. GENTLY (you do not want your frittata to fall) pull out oven rack and sprinkle Panko bread crumbs and the cheese of your choice over the top. Return to oven and continue baking another 22 minutes or until firm. To check for done-ness, insert a toothpick into the center of the frittata. If it comes out clean, it’s done. To use the chef method, using your three center fingers, gently touch the center and if firm to the touch, your masterpiece is ready. Just be careful not to burn yourself. Prepare fruit, slicing the banana and cutting the remainder into half-inch cubes. Combine in a bowl. If you want to kick the flavor up a notch by adding the jalapeno, be sure to de-seed it before finely chopping. Finely chop cilantro and add both jalapeno and cilantro to fruit mixture. Squeeze the juice of three limes into the bowl and drizzle with honey. 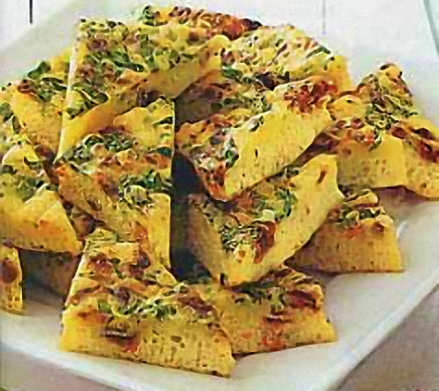 Gently mix and let sit in the refrigerator while preparing the frittata, allowing flavors to marry. Serving a basket of piping-hot biscuits with this is always a nice touch. Use any basic biscuit recipe and again, for a more personal touch, add a bit of the queso fresco, crumbled goat cheese or even cheddar cheese — whichever is your preference — to the mix. These cheeses are dry enough to hold together through baking. Jalapeno jelly presented on the side is a nice touch as well.